Solar power is a great option for alternative energy, but may not be practical for various applications. One way to use solar energy for little cost is to make a solar power box to charge electronics and items when camping or when electricity is not available. This is a great way to keep a smartphone or a mobile device charged. There are many parts needed to build a solar power box that will need to be acquired. The best way to get everything you need is to use the Internet. Two important items are solar panels and batteries for storage of the electricity. Another item that is necessary is a power inverter. Amazon will have all the items that are needed when you are ready to build a solar power box. 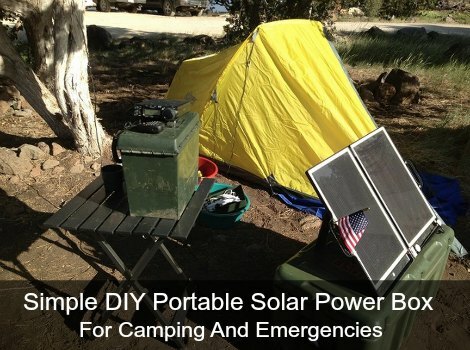 The key to a simple solar power box is making it portable. This means using a box that fits an assortment of parts that are needed for the device. The battery should be a deep cycle as this will be a better product than a standard battery. Proper assembly is necessary or your solar power box will not work correctly. This means testing the unit to make sure all the connections and components are working properly. One item you need for the box is a USB port to use for charging your electronic devices. The best option is to use the adapter that comes with most smartphones as this is cheaper than adding a separate USB port to your solar power box. If you are not sure about the type of box to use for the device, then one option is to use a plastic tool box or heavy duty cooler. These items can easily be found online.